Posted by Ray Poynter, 1 February 2019. This week the new ESOMAR Council had its first independent meeting (the previous meeting in December last year having been a handover meeting with the retiring Council). Our new President, Joaquim Bretcha, chaired the meeting and shared his vision for where ESOMAR should be heading over the next two years. Joaquim’s vision builds on the work of previous Councils and focuses on the need to embrace the changes being created by an increasingly digital age. At the heart of the vision is the need to enlarge the scope of ESOMAR to include a wider range of data analytics and data users. One encouraging sign for the relevance and viability of this vision is the number of data-focused organisations that are asking to talk to ESOMAR. They want to talk to us because ESOMAR is seen to be ahead of the curve in terms of GDPR. The ethical/reasonable use of personal data becoming a key issue, and companies want to avoid the sort of traps that Cambridge Analytica fell into. Xabier Palacio presented the results of the most recent membership survey. The good news was that about 90% of members said Yes, they were satisfied (some fully and some partly). The less good news was that the balance between fully satisfied and partly satisfied has shifted towards partly, compared with earlier years. Analysis of what members wanted more of identified that three headings accounted for 90% of members’ desires: 1) Knowledge, 2) Access to the industry (commercial), and 3) Networking (general). These three will be priorities for both the Council and ESOMAR’s professional staff over the next two years. ESOMAR is a global organisation and its local presence is dependant upon a global team of volunteers, the ESOMAR Representatives. These people are key to our organisation, as they provide us with essential information on local and national market issues and opportunities, as well as being the conduit through which ESOMAR can provide value around the world – particularly through events such as Best of ESOMAR. One of the new Council Members (Lucy Davison) brings with her the insight of having been one of the UK Reps for several years. It was agreed that to continue to build our community, a greater emphasis (and support!) needed to be placed on Reps and their communities, for example by providing more guidance and “best-practice” references in facilitating each national ESOMAR community. The best Reps are great. There are plenty of Reps who could be even better if they had a clearer grasp of what is needed and access to best practices. However, there are a few Reps who need to either up their game or move aside to let others step up. Expect to hear more over the next year. The USA is home to a large number of ESOMAR Members (it vies with the UK to be the source of the largest number). But, given that the USA represents over 40% of global market research (by spend), the numbers are not as high as they could/should be. Similarly, the relevance of ESOMAR to USA-based researchers is not as high as we would want it to be. The USA is going to be a focus for increased membership over the next few years. Our aim is to connect more USA-based researchers with the global benefits of ESOMAR, in addition to the benefits they can find locally. Anybody who has been following the trade news will have noted that the Canadian market research association, MRIA, went spectacularly bust last year. A group of nine Canadian research companies have stepped up to help create a new body, CRIC, and they have turned to ESOMAR as a partner. Going forward we are hoping there will be a high degree of coordination between CRIC and ESOMAR – more news soon. The Council agreed the budget for 2019. In discussing and voting on the budget the Council recognised that 2019 could be a very difficult year. A difficult year for the global economy, for companies and individuals. Consequently, we will be paying even more attention to monitoring revenue and expenditure in 2019. Niels Schillewaert, who as the immediate Past President of ESOMAR is on Council ex officio, will be leading a review into how ESOMAR Council elections are to be held in the future. Among the changes he will investigate are the ways canvassing should be conducted, what should the membership of Council be, and how long should the term of office be. Joaquim has created four work groups and two key portfolio responsibilities; these are set out below. End Clients – This group will focus on ensuring that research becomes ever more relevant to end clients, that ESOMAR and it activities meet the needs of end clients, and that the changes that are happening with client-side organisations are supported. This group will be led by BV Pradeep and supported Niels Schillewaert, Lucy Davison. Market Research Agencies and Suppliers – Most of ESOMAR’s members and most of the revenue that supports its activities come from market research agencies and from the suppliers of services to the market research industry (such as panel companies). This working group will work on ensuring that ESOMAR is aligned with the needs of agencies and suppliers. This group will be led by me (Ray Poynter) and supported by Umesh Kumar. Data Science – if the scope of market research is to be expanded to encompass the wider uses the analysis of personal data we need to build bridges with the data science community and organisations. This working group will be led by Joaquim Bretcha and supported by Alain Mizrahi and Kristin Luck. YES/Diversity – one of the success stories from the last few years has been YES Young ESOMAR Society), a move which has resulted in a Fantastic improvement in the number of young members of ESOMAR. This working group will continue the work with youth, but will also focus on diversity issues, including the need to create a code of conduct for personal behaviour. In addition two important “portfolios” were created, to allow Council to better understand and appreciate the needs from…. The regions will be supported by individual members with a remit to help the local Reps and associations meet the needs of local markets. This will include an emphasis on things like our reinforcement of our presence in the US, but also on partnering with our LATAM representative community to understand how we can better serve our members there. BV Pradeep was unable to be physically in Amsterdam, but was able to join the meeting virtually. Pradeep’s ability to follow the flow of the conversation around the table was greatly enhanced by a cute device called an Owl (see picture). 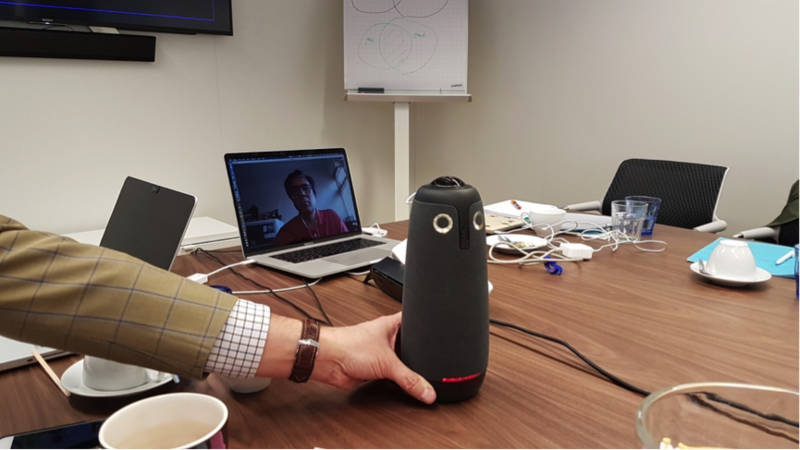 The device has a 360-degree camera and focuses on the face of a speaker by tracking the sound of her/his voice.